Sister-in-law took a comment earlier in the year to heart whilst shopping for me. The Comment: "Everything's better with Bacon." The Result: A series of bacon-themed Christmas presents, including three pounds of premium bacon. The Verdict: Christmas is definitely better with bacon. Those books will bring you pleasure for so many years to come! What wonderful gifts from the family who obviously loves and encourages your art. Happy Christmas! We had an art-book themed day here, too. Well, the guys did. We gave Pip the Touch the Art series, and Andrew received books on the art in St. Catherine's monastery. Alex - I heard about the bacon cheesecake earlier this year, inspired by that same sentence... Sounds like there will be some good eating over there. DCup - Yes, I'm really fortunate to have encouragement and understanding about this. Some people are threatened by a spouse or parent who pulls so hard towards something besides family, togetherness, etc. - but my family sees this as me being more me, and therefore more here for them, not less. Often they see this more clearly than I do, which is a big help. Phoenix Berries - That's it, get Pip off to an early start. And congrats to Andrew on the art of St Catherine's! BTW I loved watching your glee when you got to really let go in the Cherry Tree Carol last night. I'm not sure how much of your power we were hearing, but on some of those loudest highest notes you were having SUCH a good time. AND I wanted to thank you for coming over and telling me to come up to receive Eucharist with Dearest. I would not have done it except for the prompting. I feel so many confusing pressures and boundaries in church, as if I were trying not to trip alarms by cutting off all these intersecting and barely visible beams of light. There is nowhere on earth I feel less free than in church, which I know is a shame, but there it is (for now). So I got such pleasure watching you cut loose in that song, and hearing you do it on some of the descants, as well. It's making me smile all over again thinking about it. hi steve, sounds like you had a wonderful christmas! I had a ball singing the Angels We Have Heard on High descant. That was my favorite part of the service- getting to outsing the brass (Andrew said he heard me loud & clear outside the Nave). I felt pretty happy then, getting to use my real voice. I'm glad the fun of it came across. Yes, church can be so awkward. I myself never know what to do with my hands. I'd take up knitting if it weren't for my other clutter- er, crafts- taking up so much energy already. In the summer I bring crayons to the pew and sketch little images of souls and the City of God. 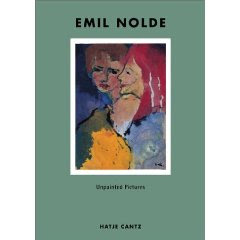 Linda - I think you would like all of them - while the Nolde story is depressing, the paintings are quite the opposite. They are full of light, color, and joy. 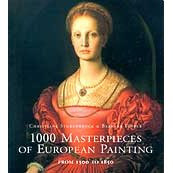 I think you would also love the 1000 Masterpieces book. Summer - I love the thought of you sketching with crayons in church! What a lovely idea. I did not receive any art books this year but I'm so glad you did! Please share whatever you can with us in the coming days! Merry Christmas to you and Moonin and the kids!